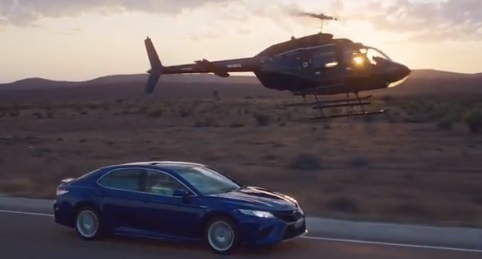 Toyota promotes the “most powerful and efficient Toyota Camry ever” in a new commercial running in Australia. The spot, created by agency Saatchi & Saatchi and focusing on some of the most important features of the reimagined Camry, highlights that this car defies limits, authority, convention, and all expections. The soundtrack music is the 2013 single “Black Skinhead” by American rapper Kanye West, from his sixth studio album, “Yeezus”. This ad is part of a multi-channel campaign titled “Defy Expectation” and developed by the automaker in partnership with Australian media company HT&E’s ARN and Adshel, campaign which also included a full day takeover of ARN’s Pure Gold national network. People who have defied or are defying expectation, from sportspeople to artists, have been celebrated, on March 29, in a dedicated broadcast platform on the Pure Gold Network. In addition, on the same day, more than 150 Adshel Live digital screens in key metro locations displayed the all-new Camry creative in an attempt to reach the automotive company’s target audience in an engaging way. The all-new Toyota Camry range includes Ascent Sedan, Ascent Sport, SX and SL, with prices ranging from $31,401 to $44,228 in Australia. Prices vary by state.